With heart Qi deficiency.., we have observed energy related conditions of heart. …glad you asked the question…! 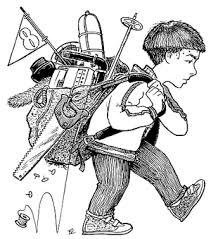 In my effort of conveying the concept of it, let me ask you couple of questions..
How much does your child’s backpack weigh when they head off to school in the morning? Do you know? It’s okay if you don’t. The truth is that most parents don’t know but you need to. A backpack weighing more than 15% of your child’s body-weight can damage their developing spine.